With the release of their latest effort PAIN earlier this year through Graveface Records,the up-and-coming Los Angeles, CA-based noise rock/shoegaze trio Tennis System has developed a reputation for a classic 4AD Records sound: squalling feedback-tinged power chords fed through delay and effect pedals, thundering drumming and ethereal melodies, centered around a rather sunny ambivalence, and a sense of profound loss — and for quickly establishing themselves as one of their hometown’s best, new live bands. 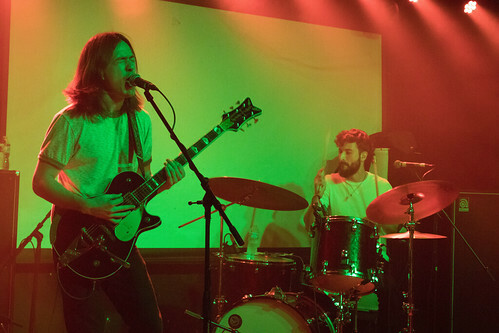 In fact, the trio have played sets at Austin Psych Fest, Noise Pop Fest, Echo Park Rising and the Air & Style Festival, and have shared stages with The Flaming Lips, Ride, Dinosaur Jr., Kendrick Lamar and Diiv among others. “COMINGDOWN,” PAIN’s latest single will further cement the band’s reputation for crafting a familiar and beloved sound — in this case, recalling My Bloody Valentine, A Storm in Heaven-era The Verve, JOVM mainstays Dead Leaf Echo, My Vitriol and others but with an anxiety of wha the future could hold, after a horrible event that the song’s narrator knows they will regret. Directed by Logan Rice, the video follows Niamh Hannigan as she distractedly goes through her day — and through a series of rapidly changing colors, grainy fade outs and fade ins, the video suggests that its protagonist is slowly coming down from the throes of hallucinogenic fugue. Currently comprised of founding duo Dennis Ponozzo (bass, vocals), a former member of Below the Sound and Scott Udee (guitar), with Gabe Johnson (drums), the Madison, WI-based post-punk/noise rock trio Sinking Suns initially formed in 2007 as a duo, and after a series of basement recordings, the band expanded into a full-fledged live band with the addition of Gabe Johnson, who joined the band in 2009. Since then, the band has released several highly touted albums and singles while touring across the Midwest, playing a sound that features a unique blend of post-punk, noise rock, surf rock and thrash punk. Slated for a July 27, 2018 release through Reptilian Records, Sinking Suns’ soon-to-be released full-length album Bad Vibes will further cement the band’s reputation for a scuzzy and bruising sound, as you’ll hear on the album’s mosh pit friendly new single “Remember You Will Die”– but the album thematically and sonically is centered around deeply personal tales of struggle, survival and mourning; in fact, as the band’s Dennis Ponozzo explains, the song was inspired after he had been reminiscing about the last time he saw his brother, before his death. “I was looking at old photos of him and remembering when we drove to a local “ghost light” in Michigan one night called The Paulding Light. It was a warm summer night. Looking at the photos I thought to myself how he was clueless in the photos that his number would soon be up. I was clueless. We all were. It’s mainly a reminder of all of our mortality. ” As a result, the song is a urgent and plaintive howl into an unceasing and uncaring void. This summer, the up-and-coming Gothenburg-based indie rock quartet will be touring across Germany and Sweden to support their recently released “Can You Feel the Rush”/”Nothing to Claim” 7 inch single, which will further cement their reputation for crafting 120 Minutes–era indie rock, complete with fuzzy power chords and sneering vocals — but the band’s newest material is arguably the most ambitious of their young careers, as it finds them writing some of their most self assured and arena rock friendly songs they’ve released to date; in fact, “Can You Feel the Rush” and “Nothing to Claim” are jagged and jangling tracks centered around four-on-the-floor drumming and some impressive and explosive guitar pyrotechnics. Over much of the almost 8 year history of this site, I’ve written quite a bit about JOVM mainstays Bambara, comprised of founding, core trio twin brothers Reid and Blaze Bateh and their childhood friend William Brookshire, and as you may recall the trio’s soon-to-be released Andy Chugg-produced third, full-length album Shadow on Everything is their first for Wharf Cat Records, and it reportedly represents a decisive step forward with the band moving from the early noise rock and post-punk that inspired their first two albums with the new album being a Western Gothic concept album. And while the musical center remains the trio’s tight and forceful rhythm section featuring Blaze Bateh’s frenzied yet incredibly metronomic drumming and Brookshire’s propulsive bass lines, which manage to be roomy enough for for Reid Bateh’s howled vocals and squalling, feedback heavy guitar. Unlike their previously recorded output in which Reid Bateh’s vocals were deeply buried in the mix, Shadow on Everything finds the band placing Reid Bateh’s vocals at the forefront, symbolically placing the damaged characters and seedy locales of his lyrics at center stage — and while the overall sound is cleaner, as you’ll hear on “Jose Tries to Leave,” the album’s first single, the band has retained the forceful and nightmarish dynamism that has won them attention; but interestingly enough, the album finds the band experimenting with their sound as some of the material features violin and cornet arrangements, as well as ambient noise loops distilled down from hours of manipulated vocal collages the band shifted through to find the perfect texture. “Doe-Eyed Girl” Shadow on Everything‘s second and latest single continues in a similar vein as it features Spaghetti Western-like guitar work, explosive bursts of feedback and a punk rock-like propulsive rhythm section that gives the song a cinematic yet menacing quality paired with an unusually empathetic portrayal of the damaged characters and nightmarish scenarios that have long inhabited their material imbued with a sweaty and furious urgency, fueled by a desperate and manic obsession. Although she is all of 25, the New York-based singer/songwriter, multi-instrumentalist and studio engineer Eva Lawitts has had a rather accomplished music career –beginning as a high schooler, she’s had stints in the likes of Vagabon, Citris and others, touring across the US a number of times — and as a studio engineer, she runs Wonderpark Studios with Chris Krasnow. Interestingly, Lawitts’ solo recording project Stimmerman finds the accomplished New York-based singer/songwriter, multi-instrumentalist and studio engineer stepping out on her own as a creative mastermind and frontperson; in fact, with her Stimmerman debut, Pleasant Vistas in a Somber Place EP, Lawitts wrote, arranged and performed all of the vocal, guitar and bass parts with Beach Fossils‘ touring drummer Russel Holzman and acclaimed trumpeter Adam O’Farrill on an effort that as she told New Noise Magazine were drafts of a songs written for a new album by a now-defunct band she was in. “I had completed most of the instruments by fall 2016, the band I had written the songs for broke up in December, and I spent the firs half of 2017 racing around on tour with a horde of other musicians and bands, mostly getting really depressed in vans and hotels around about the sudden lack of direction in my life, and attempting to complete these songs on my own,” she explained. And as a result, the EP’s material reflects a childish moroseness and an impotent bitterness and frustration. Reportedly, the EP’s latest single “Tough Talk” were culled from half-remembered conversations during a particularly intense period of touring, as well as her running commentary on those memories, followed by a sort of conclusion about how even attempting to reach a conclusion about what it all was supposed to mean was futile, and those observations give the song a bilious fury and frustration — while sonically, the song finds Lawitts drawing from prog rock, indie rock, noise and punk in a way that reminds me of The Mallard‘s Finding Meaning in Deference.